The fall is the perfect time to get outdoors! The leaves are changing, the air is cool and our hatchery staff is busy stocking tens of thousands of brown, golden and rainbow trout to lakes, ponds and streams near you. What do you mean by stocking? With the money raised from our yearly trout stamp (license), we purchase tens of thousands of trout eggs. These eggs are raised in our hatcheries (farms for fish) until the trout are born and raised until they get big and strong. When they are big enough, they are released in stocking locations across the state. Fishing for trout can be an amazing experience, but it takes a lot of determination and skill. The fall is the perfect time to practice! There are even special management areas designated for trout fishing just for you! If you would like to visit one of our state-owned hatcheries, please let us know. 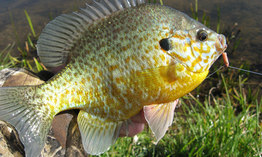 The pumpkinseed is a bright, beautiful sunfish with a saucer-shaped body that is mottled orange, blue and green. It lives in freshwater lakes, ponds and streams throughout Chesapeake Bay. I can remember my first fish as if I had caught it yesterday. It was a small but spirited bluegill from the waters of the Gunpowder River on a simple cane pole. 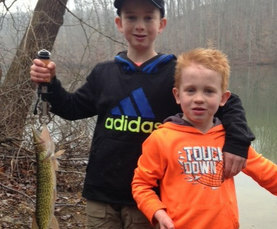 Indeed, a defining moment in the life of a young angler. I haven’t been the same since! Now, sixty years later, that special joy and excitement still fills my spirit every time I see a bobber dip below the water’s surface. To be honest, most of today’s anglers have had a very similar experience to launch their angling careers. And why not? 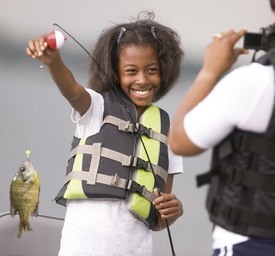 Bluegills, and close kin, are the perfect fish for not just children but for families alike. Read more at Fish and Hunt Maryland. Largemouth Bass: Found in shallow water because lakes, ponds and rives are cooling and the water is warmer. Use spinnerbait, crankbait, topwater lures and swimbaits. Muskie: Found in shallow water, mostly lakes and large rivers. Use swimbaits, fishing spoons, spinners and jigs. Striped Bass: Found in shallow water with cooler temperatures. Use circle hooks. Trout: Found in deep colder water; abundant in streams and rivers, and some lakes. Use fly-fishing setup, spinnerbait, jibs tipped with plastic, top water lure. Walleye: Found close to shore in weeds and other cover. Use jigs tipped with plastic crankbaits.